Q- Who is doing the survey? RPU has hired GreatBlue Research to facilitate the phone survey and online survey. Q- What is the point of the survey? The RPU Utility Board wants to gather feedback from residential customers about their level of understanding and support for different types of rate structures. Q- What are the rate structures that GreatBlue Research will be asking about? The Flat Rate Structure with monthly customer charge entails a consistent rate for electricity use at any time of day, resulting in a lower cost for low energy users. Time of Use Rates charge customers higher rates for using electricity during peak times and lower rates during off-peak times, providing customers with options to reduce their bill by modifying their behavior. The Block Rate charges customers based on changing levels of energy consumption – customers who use more energy will be charged at a higher rate, resulting in an increased cost to high energy users. The Inclining Customer Charge bills customers a monthly fee that doesn’t change based on usage. The more electricity a customer uses, the higher the monthly charge, but the cost per kilo watt hour will not change, yielding a lower cost for low energy users. Q- What is the window of time that they will be calling RPU customers? GreatBlue Research will be calling customers from February 20th to March 6th. Q- How long will the phone survey take? The phone survey will take approximately 8-10 minutes. Q- How will I know if it is Great Blue Research calling me? GreatBlue Research will show up on caller ID and the phone number will be 860.740.4000 or a variation of that (i.e., 860.740.4005, 4006, 4007 etc.). Q- What if I’m not able to find time to do a phone survey, but would like to provide feedback still? An online survey link will be available on the RPU website after March 6th. The Rochester Public Utility Board was presented with the customer survey results at the July Board Meeting by representatives from GreatBlue Research. The purpose of the survey was to identify customer views on a wide range of topics including RPU’s environmental stewardship efforts, renewable energy, future technologies, smart grid metering, communication, office hours, and overall customer satisfaction. 87.8% of residential customers “agreed” that RPU is an environmentally responsible company. 88.2% of commercial customers “agreed” that RPU is an environmentally responsible company. 59.2% of residents and 49.5% of commercial customers reported RPU should be “aggressive” in setting goals to reduce greenhouse gas emissions. 29.0% of residents would be willing to pay 10% more to increase efforts to reduce greenhouse gas emissions and another 25.6% would be willing to pay 5% more. 83.7% of residents and 70.8% of commercial customers support RPU investigating the process of installing and maintaining solar power in homes/businesses. Overall, respondents were happy with office hours – only 17.9% of residents said it would be helpful to have longer office hours and 12.1% of businesses said it would be helpful to have longer office hours. Regarding communication, 41.8% of residents and 41.6% of business reported the “internet” was a preferred source of information. Customer satisfaction continues to be strong with 95.7% of respondents reporting to be “satisfied” with RPU representative interactions. “The information also reinforces that we are doing a lot of the right things necessary to set the standard for service and to continue as a customer-focused organization. 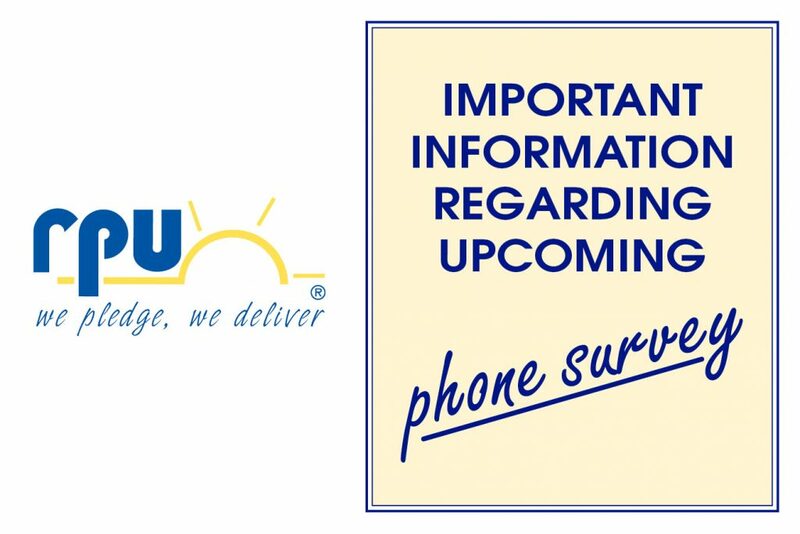 This survey information will provide staff and the RPU Utility Board with valuable insight from customers for future strategic planning, budgeting, and allocating of resources to make improvements in how we serve our customers in the future,” said RPU General Manager Mark Kotschevar. The complete survey presentation is available to view on the RPU website, http://www.rpu.org/documents/2015_customer_survey_data.pdf. 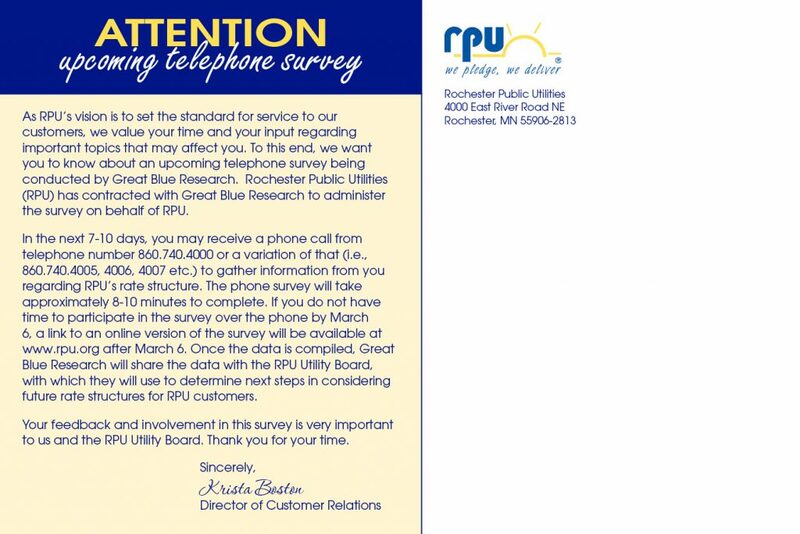 Rochester Public Utilities (RPU) will be working with a survey company to facilitate a phone survey from June 1- June 19. As part of the process of preparing a long-term strategic plan for the utility, RPU is conducting this survey with over 1,200 randomly selected customers who will have the opportunity to participate and share their views about important issues. Customers may receive a call on either a landline or cell phone. If you receive a call on your cell phone while you are out and about, simply let the caller know and they will be happy set up a time to call back. The survey questions have been designed to help RPU better understand the opinions of its customers about a variety of topics such as perceptions of the company, interactions with customer service and field service personnel, billing and alternative energy. The survey itself will be conducted by GreatBlue Research, Inc., a professional research firm located in Cromwell, CT. This survey will be vital in helping RPU understand the concerns and priorities of its customers and guide them in making decisions that best reflect the goals and expectations of the Rochester community. If you have questions regarding the survey, call RPU at 507.280.1500. Question- Why do you vist the RPU web site?